This has already been blogged quite a few times by people, however I regularly have to google how to Show hidden files on Mac OS every time I re-build my Mac or buy a new one. Thanks to OSXDaily for the original information. Show Hidden Files on Mac OS X Launch terminal defaults write com.apple.Finder AppleShowAllFiles TRUE killall Finder Make sure you restart the finder by doing the killall command. If you want to hide the files again, follow these instructions: defaults write com.apple.Finder AppleShowAllFiles FALSE killall Finder Not much too it, just wish I could remember the command! This little easter egg has apparently been around for a while, but I never knew about it. 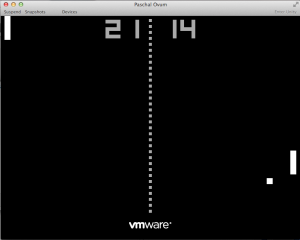 To enable the hidden easter egg in VMware Fusion 3, hold down Shift-Control-Command-Option and press V. You will then be relieving your childhood playing pong. This is really cool. Today I have been working on a document using dropbox. I now have a conflicted copy saved by my colleague and I wanted to know how to compare the differences. Now the long way is to do a stare and compare, however I knew that the Windows version of Word offered a compare facility. I started looking at the options in Mac Word. The following steps are how to compare two documents using Microsoft Word 2010 for Mac Open both the documents you want to compare Select Tools Goto Track Changes Select Compare Documents… You are prompted with a window where you can select the two documents to compare Click Ok The documents will be compared and merged into a new document. Really easy.